Why does Klipfolio need specific permissions to connect my service accounts? – How can we help you today? The reason Klipfolio asks for these permissions is to allow the Klipfolio app to connect to your data. Without this permission, you will not be able to use your data in the visualizations you build. In other words, your queries to a service like Google Analytics define the permissions required. Part of the authentication process for services like Google that use OAuth (a secure authentication method) requires that you allow Klipfolio to access information and data associated with your account. By design, Google protects users by asking an app like Klipfolio to apply for and then request permission from the user. For some services that cover many different apps, like Google, you might notice more permission requests than you expect. The reason is that an app like Klipfolio will use the same credentials or OAuth token to later connect to additional accounts if you choose to connect to them. Klipfolio asks for read only permissions where possible, but some services that only have one level of permission Klipfolio may request read/write permission. It's important to note, however, that Klipfolio never actually writes data to your data source. If you manage multiple accounts and you want to connect data from those accounts, Klipfolio will ask for additional permissions. 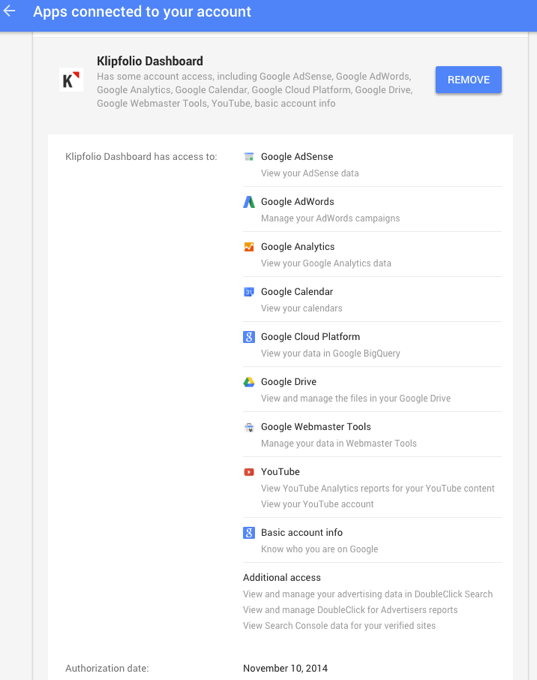 Also keep in mind that when you first authenticate with Google (say, for a Google Analytics Klip) you'll notice that Klipfolio asks for permissions to access YouTube. However, we won't actually access YouTube data until you create queries against YouTube. By asking for it when you first authenticate, it makes it easier for you to connect to other Google Services later on. Note: You can view the services that you have connected to Klipfolio in Connected Accounts (Log in to your Klipfolio account and go to Accounts > Connected Accounts). Permissions may range from collecting the number of Tweets retweeted and the number of Tweet Likes associated with your Twitter account to things like viewing your Google Calendars, viewing your Google Analytics data and so on. To view the apps, sites and devices that you’ve authorized to access your Google Account, go to Apps connected to your account. 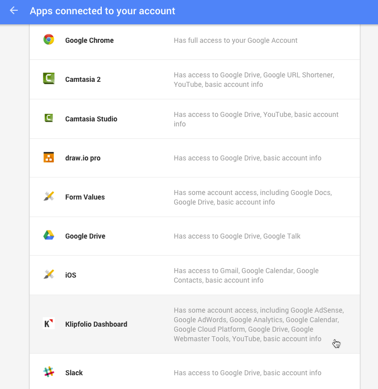 You will see a list of the services you connected to your Google Account (see image below). Click on a service to see more information (see image below). What does Klipfolio do with the information it collects? The data Klipfolio collects is not placed in long term storage. Nor is it used for any other purpose except to allow you to build visualizations using your data. Please review our Privacy and Security policies. Is the app or service from a trustworthy source? Do I understand why this app needs these permissions? Does the app developer explain why they need these permissions?